To me Henry Bayman is one of the most important contemporary writer of Sufi Science. This modern transmitter of the Path is an American Engineer and an independent scholar who lived in Turkey for more than twenty five years and is a direct student of grand father of Sufism, Ahmet Kayhan, may Allah be pleased with him. 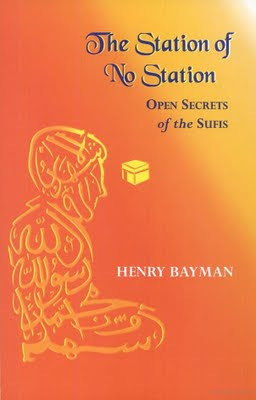 Henry Bayman's book, Station of No Station: Open Secrets of the Sufis is a serious and important book on Sufism. As its reviewers mention, "As excellent as this book is, it is not an Introduction to Sufism. The reader must decide: Is it my heart I want touched, or my head?.. if heart, then this is a book to pick. Moreover, Bayman's Sufism is firmly rooted in Islam; his Sufism is serious stuff, not the deracinated Universal Religion of New Agers. The Station of No Station, in essence speaks from the very heart of Islam... The Pure Islam, which was practiced by the Prophet Muhammad himself. Henry Bayman, who has a profound understanding of Islamic Sufism, spent most of the last quarter of the twentieth century with the great grandfather of Islamic Sufism "Ahmet Kayhan". In this contemporary book of authentic wisdom, Mr. Bayman has in a sincere, direct and clear manner colourfully explained and presented those very Pure Teachings of Islamic Sufism. This book is without any doubt essential for anyone interested in spirituality, religion, mysticism and love..."
The section shared here is important and carries some essential fundamental of spirituality. Increasingly this theme is missed in the contemporary, new age flavored spirituality. But ignoring this particular dimension is suicidal for spiritual progress. May this sharing be useful to us all. For centuries, theologians and philosophers have been debating the existence of God. They have tried to approach the subject by way of rationality. Finally, they have realized that the existence or nonexistence of God is not open to logical proof. This has led, in our age, to a widespread agnosticism among those who are informed about such debates. Agnosticism holds that is it not possible to know whether God exists, let along anything else about Him. But philosophy is not the place where matters about God can be decided. Nor, in reality, is theology, which may be regarded as a branch of philosophy. When you want to decide about the existence of a chair, you do not set about proving it logically. Any prophet, saint, or mystic will tell you that the existence of God is an empirical matter, not a logical one. The difference from a chair is that while the existence of a chair is easily determined, God, who is the best-hidden secret of the universe, can be known only by the utmost sustained effort, and then only by a very few. Nevertheless, it is possible. To paraphrase Meister Eckhart, "man’s predicament is that he wishes to perceive God in the same way he perceives a cow." The universe is a vast game of hide-and-seek, a cosmic treasure hunt, where the hidden treasure is God. If this is true, we may identify the procedures and practices of Sufism as a map that guides us to the treasure. “Take five steps northward from the gnarled old tree, then turn left and advance ten paces…” One wrong move, and there is scarcely a change the treasure will be found. Deep within, human beings have undeveloped organs of perception that can, if cultivated, lead to incrementally increasing knowledge of God. 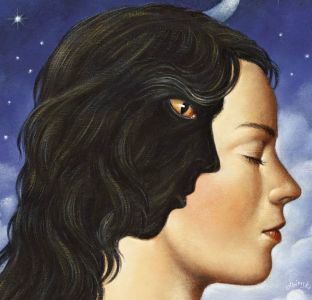 In Sufism, this is known as Gnosis, or “God-knowledge” (marifat-Allah). In contrast to agnosticism, Sufic Gnosis teaches that God can known. This occurs in three stages. The first stage is theoretical knowledge of God (ilm al-yaqin, “the knowledge of certainty,” “knowledge without doubt”). This has been compared to the knowledge of fire that a person who has never seen fire possesses. The second stage takes us a step further (ayn al-yaqin, “the eye of certainty”). As one learns God-science and carries out certain practices, one begins to perceive, if not God Himself, incontrovertible signs of His existence. This has been compared to catching sight of fire from afar. The third stage is a manifestation that leads to no doubt whatever about God’s existence in the mind of the person who has the experience (haqq al-yaqin, “the truth of certainty”). At this stage, all doubts are swept away. This has been compared to being burnt and consumed in the fire. Culmination of Gnosis (marifah) is Truth or Reality (haqiqah) – in other words, the direct perception of Ultimate Reality, the Ground of all Being. The most important things about Ultimate Reality is that He is nondual, i.e. One. Whereas all the realities we know are based on multiplicity, the direct perception of Unity (al-Ahad) allows us to conclude that the multiplicity is an epiphenomenona and nonessential, if not outright illusory. This process of slowly rising towards the Truth (al-Haqq) is also called Unification (tawhid). We should be careful to note that One we are speaking of here is not a number like any other in the infinite arithmetic sequence: 1, 2, 3… Rather, He is the “One without a second,” a Unity so all-encompassing that anything beyond it cannot even be imagined. This may all sound highly abstract and abstruse, but it is a direct and immediate perception in mystical states of consciousness. In the nondual states of perception, when the Unity of Absolute Reality (God) is perceived, it becomes clear that there is no subject acting on an unconnected, independent object. For the duality between subject and object is transcended. There is no subject or object (Unity: Ahadiya). Or, descending one stage lower (Union: Wahidiya), to the extent that one can talk about subject or object, the object is the subject and vice versa. Nor can one talk about a multiplicity of subjects or objects from the stand point of Absolute Unity. And Absolute, unconditional, or non delimited reality is the Ultimate Ground of all Being from which all relative, conditioned or delimited realities – “worlds” – emerge. So even though we live in a world of multiplicity, the truth of that world is actually Unity, although we would be hard pout to recognize it as such. Note that we carefully refrain from equating God with the universe. The universe is of God, from God, created by God (and actively sustained by Him continually). But the universe is not God, because God is beyond all worlds and beyond the universe – even though He is also within even the tiniest particle (“the Beyond Within”). To exist in the human condition is our common lot, and from the man’s-eye point of view we are not permitted to phrase this in any other way. If we fail to acknowledge this, we run the risk of collapsing God onto the universe – of saying that the collectivity of all things is God, which is pantheism. The great Sufi sage, Ibn Arabi claimed that the Whole of Being is One. For this reason, he has often been accused of pantheism, even though his doctrine of the “unity of existence,” of things, of objects (wahdat al-wujud), is not intended in that sense (Ibn Arabi himself never used that term). Several centuries after Ibn Arabi, in order to counter this tendency, another great Sufi sage, Ahmed Sirhindi, the Renovator of the Second Millennium anno hegira, suggested it would be better to speak of a “unity of observers” (wahdat al-shuhud), or souls or subjects. Both were right. The who are two sides of the same coin. Of course, in Ultimate Unity, the object/subject distinction disappear altogether, but until that point is reached, Sirhindi’s approach is the more useful and less dangerous one, which also finds support in the sacred verse already mentioned: “We created you (mankind) of a single self.” But Ibn Arabi himself never intended pantheism. This poetic vision has been known to be scientifically true ever since Barry Commoner formulated the first law of ecology: “Everything is related to everything else.” Moreover, the concept is receiving physical confirmation as quantum entanglement begins to imply that we live in an infinitely multiply-interconnected universe. (Gravity already weaves together all regions of the cosmos). Yet at the same time, there are distinctions to be observed in accommodating that apparent multiplicity. So how do we proceed, how do we tune our actions? According to the Divine Law outlined by Ultimate Reality. Of course, the Law has diverse ramifications. But here we are interested not in the details, but in the root of the matter. When we view the Law in this way, we see that it is concerned with the rights of all creatures. Even the tiniest ant has its rights when we interact with it, and – this bears emphasis – man is responsible for rights, and for rights alone. But what faculty in us recognizes these rights and strongly opposes their violation? Is it called conscience. But conscience itself springs from another faculty, and that is love. I hesitate to call love a feeling, an emotion, because it is more than that – much more. Love is the fabric out of which the entire universe is woven. To quote Idries Shah: “Love exists in different concentrations: or, at least, the feeling of it does. Love, devotion, worship of God, all these are of such sanctity and importance that the Sufis do not use them lightly … What other people fondly imagine as true love has been debased into a mere emotion.” And if the Divine Law is based, via conscience, on love, this means that its rules call us to act as if we loved the object of our action. For only when we love and respect something can we treat it right; only then can we accord it the same rights we assume for ourselves; only then can we “love our neighbor as ourselves.” Even if we do not feel that love, we are protected from Wrong Action by the Divine Law, which prescribes the right behavior – or at least the right attitude – suitable for every relevant occasion. It is thus that we arrive at ethics. Sufi ethics can be summed up in four words: no morality, no spirituality. At least, this was how it was exemplified by the Master, and he himself told me that what set him apart from other masters and gurus was his painstaking, or to my mind, exquisite – attention to morality. Sufism takes Islamic ethics and practice as its infrastructure to an extent that those versions of it which do not would have to called pseudo-Sufism. Probably the first principle of Sufi ethics is the words of the Prophet: “You cannot enter Paradise until you have faith, and you cannot (be said to) have faith until you love one another.” The implication is clear: Those who do not love one another cannot enter Heaven. Many stories relate acts of loving kindness and compassion as examples to be emulated. One story that apparently goes back to the Prophet relates how a prostitute was forgiven her sins because she used her shoe to draw water out of a well for a thirsty dog. The Master used to tell us: “If you see a fly in water, save it.” Even though the fly is a pest and you may want to swat it when it bothers you, the Right Action when it is in distress is to save it. He also said that even a potentially harmful animal, such as a scorpion, should not be killed unless it is actually harming us. We cannot know the inner state or station of a God-realized human being. Like everyone else, his inner experience is hidden from our eyes. But we can deduce his quality by his behavior, his ethics, which provide a sure-fire indication. The Godly person is always full of love and compassion towards other beings and acts accordingly, because God’s light and compassion flow out of such a person and into the world. The famous Persian Sufi, Bayazid of Bistam, saw in a moment of Unveiling, that the Pole (Spiritual King) of the age was none other than the town’s humble ironsmith. Bayazid was amazed, for the iron-smith happened to be a man with few distinctive qualities. Finally, unable to suppress his curiosity any longer, he went over to the smith’s shop in order to take a closer look. When he arrived, the smith was nonplussed, threw away his hammer, and tried to kiss hand as a gesture of respect – for Bayazid was a great renown – and asked for his prayers. “What‘s your problem?” Asked Bayazid. Bayazid thought to himself, “So this person is not of those who say, ‘My self, my self.’ Rather, he says, ‘My people, my community’ (just as the Prophet did). How it’s clear why the station of polehood was given to him, for he deserves it. To be concerned with the troubles of others, to try to ease their pain and heal their wounds, is an act of love and compassion. It is only those who have this in abundance who can rise to the higher stages of Sufi sainthood. In hiding the faults of others, be like the night. To elaborate, the sun rises and sheds its light on all things, without making any distinction between good and bad, worthy or unworthy, etc. Water gives life to both the rose and thistle without favoritism. The earth continues to lend its bounties to all, taking no heed of who steps on its face. And the night draws a veil of darkness over even the greatest iniquity. The Master used to say that each of these represented a pole, and anyone who was able to emulate even one of them would achieve salvation. Now the sublimation of denser energy into finer states does indeed occur. But this cannot be brought about solely by psychic techniques or psychophysical exercises, in a manner analogous to the conversation of electricity into light or heat into mechanical energy. Before such methods can work, one must first put one’s accounts with the universe in order, one must settle one’s accounts with the cosmos and God. The go-head or the signal for “all systems go” must come from every corner, from every one of our interactions with the cosmos and its Creator. Whoever breaks a Heart is ruined in both worlds. Here, if anywhere, is the meaning of our four books. This is the foundation, the cornerstone. Look at it this way: your learn the three R’s (reading, writing and ‘rithmetic) in elementary school. But you are never done with them. All through the rest of your education, you’re constantly relying on them at every step, because they’re the basis upon which everything else rests. The fruit is never a ready-made result waiting for us at the end of the road. It ripens and is infused by our actions, by each and every one of them. Our deeds determine whether the fruit we taste at the end will be full of nectar or poison. This is why ethics provides the infrastructure, and inner transformation is the superstructure built on that. There is a delightful Sufi story that graphically brings this alive. One day, Yunus was allowed to visit Hell in the Imaginal World. He found himself in a vast expanse, a veritable desert. Because he was accustomed to hearing about hell as a fire and furnace, Yunus was perplexed. How could this place be hell? A short while later, a man came by with a great load of wood on his back. He set his load down, arranged it in a pile, set it afire – and stepped into its center. “What are you doing?” asked Yunus. And the same goes for Heaven. Now, to achieve enlightenment means to reach God. In order to reach God, you have to climb higher than Heaven. How are you going to reach higher than Heaven, when your actions destine you for Hell? Let me illustrate with a story. I haven’t heard it from anyone, but it is nevertheless a story in the Sufic vein. There was a rich mogul who decided to perpetuate his name in stone by building a skyscraper. He gave the job to a construction company, showed them the area where they would build it, and busied himself with his own affairs. After a suitable period, he went to visit the construction site, expecting to find the sky-scraper at least halfway done. He was flabbergasted when he saw a gaping hold in place of a tall building. He bellowed so loudly at the construction team at the bottom of the pit that the foreman and the construction engineering came up to investigate. "What seems to be the problem, sir?" asked the engineer. "You're going in the wrong direction is what the problem is!" exclaimed the mogul in exasperation. "I'm paying you to build upwards, and here you've gong and dug me a hole instead!" "Nice cane you've got there, sir," mused the engineer, looking at the cane which the mogul had been waving like a sword. "Have you ever tried to stand it on its tip?" The mogul stopped. "What's that go to do with it?" he asked suspiciously. "You know that can't be done. I've tried it many times myself," he added. "Here, try it, go on." He passed the cane to the foreman, who took turns with several curious workers in trying to balance it, but to no avail. "With you permission, sir, may I take a look at it?" said the engineer. He took the mogul's cane and forcefully thrust its tip into the soft soil like a skewer. "You see," said the engineer, "you can't balance the cane unless a part of it is securely under the ground. And it's the same with a skyscraper. If you want your skyscraper to stand up, you have to make sure part of it is buried. That's what we call the foundation. If you want to raise a hundred-story building, you've to make sure that the foundation goes down at least seven or eight floors, depending on the texture and stability of the bedrock. That's the reason we're digging this gigantic hole. Before you lay the first stone, you've got to excavate." The mogul was thus appeased and went off a happier man. Now just as every building has to have a foundation, so must the Great Work. Liberation or enlightenment is impossible without one. And the foundation for the task of sainthood is - wonderful ethics. It is this which will prevent the sage's skyscraper from toppling at the first wind that comes along. It does not matter how high the mystic's attainment is, because if it falls down it will be of no avail. But if it can remain standing even after a storm, then it is truly unshakable and established permanently. The purpose of creation is man's attainment of God. God created the universe and lowered man into it. In order that man may take the return trip and be raised back up to God. So the more we strive to approach God, the more we are fulfilling our reason for being, not to mention the raison d'etre of the universe. But how do we approach God? A saying of the Prophet goes: "Adorn yourselves with the ethics (or: character traits) of God." 2. Knowledge / Science: God is the Omniscient, the All-knowing. 3. Power: God is the Almighty, the All-powerful. 4. Will: God wills anything He desires into (or out of) existence. prophets chosen as recipients of Revelation. 6. Hearing: God is All-hearing. 7. Sight: God is All-seeing. 1. The more loving we are, the more we approach God as Loving kindness (al-Wadud). God's creation of the universe was an act of selfless love, a love so infinite that there is no room in creation for both good and bad (God Himself is beyond both). A variant translation of the "hidden treasure" Holy Tradition is: "I was a hidden treasure, and desired to be know. Hence, I created the universe through love." God literally loved the universe into existence and sustains it through His love even at this very moment. Otherwise, the universe would have no choice but to subside at once into nonexistence. 2. The more honest and truthful we are, the closer shall we approach God the Truth. 3. The more compassionate we are towards our fellow human beings and God's creation, the closer shall we approach God the Compassionate. 4. The more merciful and forgiving we are, the closer shall we come to God the Merciful. 5. Justice is one of the most important attribute of God. The more just we are, the closer we approach God the Just. 6. The more patient and forbearing we are, the closer we get to God the patient. And so on. Let me conclude by saying, in short, that God outlined His requests of human beings in His Book and the Prophet's sayings, and does not incur God's pleasure by violating them. Obeying those requests allows us to come to closer to God by earning His pleasure, and to become more enlightened by God, Who is Light (an-Nur, 24:35). When this process reaches its climax, that is called Enlightenment, or Realization. Hence, ethics and inner transformation are directly connected. The latter does not - indeed, cannot - occur without the former since we cannot become Godly or God-realized without fulfilling the labors He has set for us or without partaking His attributes.